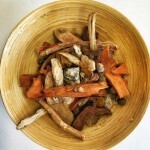 Herbal medicine is used to supplement the acupuncture treatment. Acupuncture creates a quicker initial change to the body. Herbal medicine is used to maintain the effect through the course of treatment. Each modality can be used separately but the best results occur when they are used together. We offer two main forms of herbal medicine available. The first is tea that is prepared from the raw ingredients which is the most effective because it is the most customizable for each individual but takes more time in preparing. The alternative option is encapsulated powdered herbs. These are already prepared teas in a powdered form. They can be taken directly with warm water without any preparation.